Buy a Lendrum Spinning Wheel from Jehovah Raah Farm and enjoy unconditional help in spinning for a lifetime! 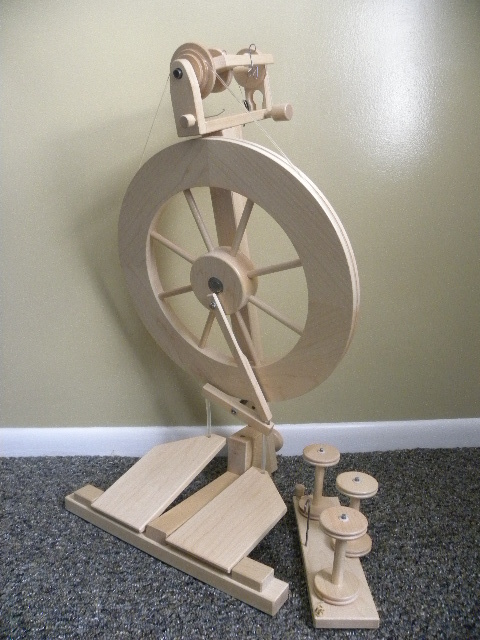 Purchase of wheel includes free spinning lesson, fiber samples and spinning assistance. Gordon Lendrum of Odessa, Ontario, is the designer and manufacturer of this sturdy, portable and versatile spinning wheel. Julie Wilson, of Jehovah Raah Farm, became a Lendrum dealer in 1996. The Lendrum spinning wheel has a unique slant design which enables more comfort to the spinner, whether left or right, because of its orifice in the center. The Lendrum has three models of wheels, single treadle, double treadle, and Saxony wheel. This wheel has a stretchy drive band and scotch tension to brake the bobbin. The Lendrum folds flat to enable better portability and only weighs 14 pounds. The Mother of All is the only adjustment to an otherwise assembled wheel. The sensitivity of the scotch tension enables a spinner to spin any kind of yarn: thick or thin, short draw or long draw, soft or firm twist. Little maintenance is needed on the Lendrum. If you would like to oil the wheel, you may oil both ends of the flyer. As with any new wheel, the drive band could stay on the flyer to “break in” the new wheel. However, there is an old tale that speaks of fairies in the night. If you don’t release your drive band from your wheel after you are done spinning for the day, little fairies will come in the silence of the night and unspin your spinning. So, beware, release the tension of the band after you break in the wheel. DOUBLE TREADLE….$630 includes: Double treadle spinning wheel, Regular flyer, lazy kate, total of 4 bobbins, threading hook, fiber sample pack (all from our animals), Spinning answers! Other attachments and parts are available.